Hello! I just love this darling Lili image from Inky Impressions, and finally broke down and bought a couple stamps : ) I decided to use Fairy Lili today for 3 challenges, although I left off a part of one challenge, so I guess it's for 2 1/2 challenges LOL! The first challenge was today's Ways To Use It Challenge on SCS to use PURPLE! The second challenge is this week's Saturday Spotlight with Hidden Potential Challenge to make a Treat Box. I used the Gable Box instructions that I found on SCS. The third is this week's Inky Impressions Challenge to use no dp but I forgot about the second part of the challenge which was faux or real stitching. Oh well, I guess I'll have to do better next time : ) The funny thing is I almost always add stitching, right!?! Anyway, I will leave a full recipe below and thank you so much for stopping by! Oh Kerri, how cute. That is a neat altered creation! LOVE THIS!!! 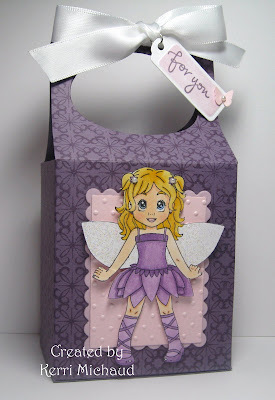 Purple is my favorite color, I love the Inky Impression images and who wouldn't love this treat bag!! Thanks for sharing it with us at Saturday Spotlight! I hope you will join us again next week! Well done! Very cute gable box. I've never done one, guess I'll have to try! Super cute gift box! I like the colors, and she is just to darn cute! Kerri she is BEAUTIFUL!!! OH MY WORD!!!! Love how you used this image!! TOOOO CUTE!!!! I am sorry I haven't been commenting too much I am just starting to feel a little better!!! Hugs!!! Thanks so much for playing along with us at Inky Impressions! Precious image and adorable treat container! Thanks for playing in this week's Spotlight challenge!! Oh Kerri...This is so sweet!!! I just love the way you colored Fairy Lili!! What a precious treat container!!! Gorgeous work my friend!! Oh, what a beautiful gift box! This little fairy is so precious! Your coloring is amazing! That is really funny that you left off stitching, because that is pretty prevalent on a lot of your projects! Still, 2 1/2 challenges is pretty good! How very very cute and pretty too!